Michael Ondaatje was born on September 12, 1943 in Colombo, Ceylon (now Sri Lanka). The son of Mervyn Ondaatje, a tea and rubber plantation superintendent and Doris Gratiaen, a part-time dancer inspired by Isadora Duncan. As a result of his father’s alcoholism, Ondaatje’s parents eventually separated in 1954 and he moved to England with his mother. Ondaatje was educated initially at St. Thomas College in Colombo, Ceylon. After moving with his mother to England, he continued his education at Dulwich College in London. Between 1962-64, Ondaatje attended Bishop’s University in Lennoxville, Quebec. He then went on to obtain his B.A. at the University of Toronto in 1965, and his M.A. at Queen’s University, in Kingston, Ontario, in 1967. Ondaatje began his teaching career at the University of Western Ontario, London between 1967-71. Today he is a member of the Department of English at Glendon College, York University in Toronto, Ontario, a position he has held since 1971. Ondaatje currently resides in Toronto with his wife, novelist/editor Linda Spalding, where they edit a literary magazine. 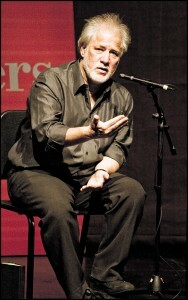 During his career Ondaatje has received numerous awards and honors. He was awarded the Ralph Gustafson Award, 1965; the Epstein Award, 1966; and the President’s Medal from the University of Ontario in 1967. In addition, Ondaatje was the recipient of the Canadian Governor-General’s Award for Literature in 1971 and again in 1980. Also in 1980 he was awarded the Canada-Australia price and in 1992 he was presented with the Booker Prize for his novel The English Patient. Anil’s Ghost won the 2000 Giller Prize, the Prix Medicis, and the Canadian Governor General’s Award. Ondaatje is the author of numerous novels, poems, plays and pieces of literary criticism. Ondaatje’s 1992 novel The English Patient, has received the most world-wide acclaim, leading to its 1996 film adaptation which won the Academy Award for Best Picture. The English Patient occurs during the later stages of World War II in a damaged villa north of Florence. The story revolves around the four occupants of the villa: Hana, the fatigued and dispassionate 20 year old nurse who is mourning a death; Carvaggio, the former spy/thief who was caught by the enemy and physically maimed; Kip, the young Indian sapper who was instructed in bomb disposal techniques in England before applying his talents in Italy; and the “English” patient, a nameless man who is severely burned in the war and attempting to reconstruct his mysterious past. In the personal recounts of the four occupants of the villa, Ondaatje develops the theme that we are all creatures of the past and try to define future events accordingly. In addition, by incorporating a variety of nationalities into the novel (Hana and Carvaggio are Canadian, Kip is Indian, and the English Patient is Hungarian), while depicting the last stages of the war in Italy, Ondaatje investigates the concept of “home” through the transient movement of the characters. Ondaatje, Michael. The Broken Ark: A Book of Beasts. Ottawa: Oberon Press, 1971. —. The Cinnamon Peeler: Selected Poems. New York: Knopf, 1991. New York: Vintage, 1997. —. Claude Glass. Toronto: Coach House Press, 1979. —. The Collected Works of Billy the Kid: Left Handed Poems. Toronto: Anansi, 1970. New York: Berkley, 1975. London: Marion Boyars, 1981. Harmondsworth, Middlessex, England; New York: Penguin Books, 1984. New York: Vintage International, 1996. —. The Dainty Monsters. Toronto: Coach House Press, 1967. —. Elimination Dance. Coldstream. Ilderton, Ontario: Nairn Coldstream, 1978. —. The Man with Seven Toes. Toronto: Coach House Press, 1969. —. Rat Jelly. Toronto: Coach House Press, 1973. —. Rat Jelly and Other Poems: 1963-1978. London: Marion Boyars, 1980. —. Secular Love. Toronto: The Coach House Press, 1984. New York: W.W. Norton, 1985. —. There’s a Trick with a Knife I’m Learning to Do: Poems 1963-1978. New York: Norton, 1979. Toronto: McClelland and Stewart, 1979. —. Tin Roof. Lantzvile, B.C., Canada: Island Writing Series, 1982. —. Two Poems. Milwaukee, WI: Woodland Pattern, 1986. Ondaatje, Michael. Anil’s Ghost. New York: Knopf, 2000. —. The Cat’s Table. New York: Knopf, 2011. —. Coming Through Slaughter. Anansi Fiction Series, No. 36. Toronto: House of Anansi, 1976. —. The English Patient. Toronto: McClelland and Stewart, 1992. New York: Knopf, 1992. Toronto/New York: Vintage Books, 1993. —. In the Skin of a Lion. Toronto: McClelland and Stewart, 1992. New York: Knopf, 1992. Toronto/New York: Penguin Books, 1988. —. Running in the Family. Toronto: McClelland and Stewart, 1987.New York: W.W. Norton, 1982. Ondaatje, Michael. Carry on Crime and Punishment. Mongrel Films/ Canadian Film-Makers Distribution Centre, 1972. 5 min. —. The Clinton Special. Mongrel Films/ Canadian Film-Makers Distribution Centre, 1972. 71 min. —. Sons of Captain Poetry. Mongrel Films/ Canadian Film-Makers Distribution Centre, 1970. 35 min. Ondaatje, Michael. An H in the Heart: a Reader. Selected by George Bowering and Michael Ondaatje. Toronto: McClelland and Stewart, 1994. A collection of writings by Canadian poet and critic bp Nichol. —. The Brick Reader. Edited by Linda Spalding and Michael Ondaatje. Illustrated by David Bolduc. Toronto: Coach House Press, 1991. —. The English Patient: a screenplay. By Anthony Minghella; based on the novel by Michael Ondaatje. Introduction by Michael Ondaatje. —. NewYork: Hyperion Miramax Books, 1996. —. From Ink Lake: An Anthology of Canadian Short Stories. Edited by Michael Ondaatje. New York: Viking, 1990 Toronto: Vintage Canada, 1995. —. Leonard Cohen. Toronto, McClelland and Stewart, 1970. —. The Long Poem Anthology. Edited by Michael Ondaatje. Toronto: Coach House Press, 1979. —. Personal Fiction: Stories by Munro, Wieve, Thomas & Blaise. Selected by Michael Ondaatje. Toronto: Oxford University Press, 1977. Duffin, Jacalyn. NYU Medical Journal. Web. Eugene, Lydia. “The Collected Works of Billy the Kid by Michael Ondaatje.” Web. Fichtner, Margarita. “Sharing The Story.” The Salt Lake Tribune. 8 Dec, 1996. Web. “Ondaatje, Michael.” The Canadian & World Encyclodpedia. McClelland& Stewart Inc. 1998. Web. “Ondaatje, Michael.” Contemporary Authors. Ed. Christine Nasso. Gale Research Company. Detroit, MI. 1979. 406. Woodcock, John A. NYU Medical Journal. Web. “Ondaatje, Michael.” Contemporary Authors. Ed. Susan Trosky. Gale Research Inc. Detroit, MI. 1994. 346-348. “Ondaatje, Michael.” The Canadian & World Encyclopedia. McClelland & Stewart Inc. 1998. Web. A good site, useful for international students to know more about authors from different countries. Is Michael Ondaatje Roman Catholic?